Jerome Duarte wins his first Youth Ranking title! The 4th youth ranking of the season saw the long wait finally come to an end for Jerome Duarte, as he managed to hold his nerve throughout the day and claim his first ranking title. In the early stages of the event, we saw some crucial wins for some players. Current youth national champion Craig Galliano managed to get the better of Justin Hewitt 2-0. 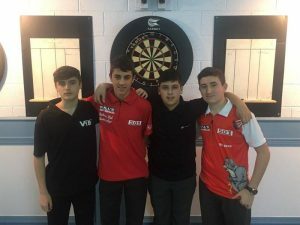 Dylan Duo Jnr managed to cause a major upset by defeating Jayc Alecio 2-1, and Joseph Borge managed to get the better of Elton Victory 2-1 in the battle of the youngsters. In the Quarter’s Craig managed to whitewash Ethan Cleverly 3-0 with a brilliant display of scoring and finishing. Kaylan Franco almost managed to pull out the biggest upset on the day narrowly losing out to eventual champion Jerome Duarte 3-2 in a last leg decider. Sean Negrette managed to hit a maximum score of 180 against Dylan Jnr in his match and secure a comfortable 3-0 win, while on board 4 Ethan Smith managed to get the better of Joseph Borge 3-0. In the Semi’s Craig Galliano managed to overcome the back to back ranking 4 champion Ethan Smith 3-0 in a fearless display. In the other Semi-Final match Jerome Duarte managed to overcome Sean Negrette 3-1 who previously beat him in the final of the last tournament. The final saw the top two youth players face off in what had all the makings in being a youth classic. Both players did not fail to disappoint, as the match went all the way to the last and final leg. Jerome got into an early lead, but Craig refused to lose without putting up a fight. Craig managed to level up the match up 3-3, but a determined Jerome Duarte managed to hold his nerve in the last leg in which both players missed chances, and take his first ranking title with a brilliant performance winning 4-3. Commiserations to Craig Galliano and Congratulations to Jerome Duarte. 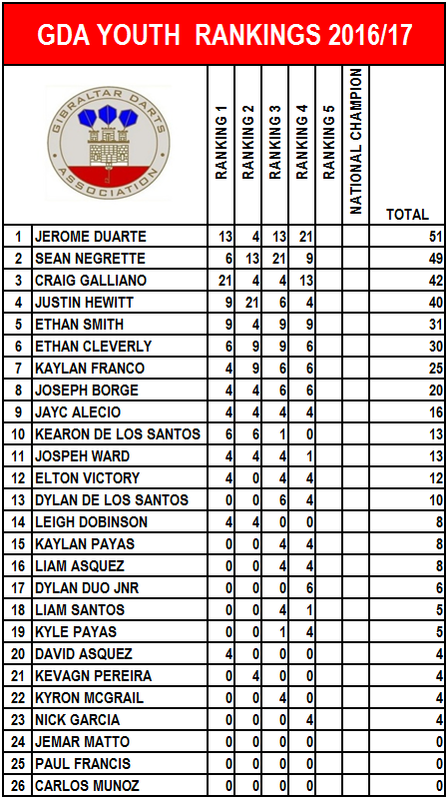 Below is the updated Youth Rankings list after 4 events played so far.